Broadband can be very complex and we try to make sure our site is accessible to everyone, however some of our more technically savvy users want to know a bit more about how the different flavours of broadband work. This page is for the geeks who want technical detail! Please note that this guide is intended for a UK audience and these technologies will vary from country to country. Broadband started to be rolled out in the UK in the year 2000 and from 2009 and onwards fibre based broadband started to appear, will hopefully explain away some of the myths and help you to understand the many acronyms that are flying around and see behind the curtain of confusion sometimes created by marketing terminology. ADSL was first rolled out in the UK in 2000 and became very popular from 2006 onwards. ADSL stands for Asymmetric Digital Subscriber Line and there have been various versions deployed in the UK, the most popular being ADSL2+ which boosted the maximum download connection speed from 8 Mbps to 24 Mbps (Mega bits per second). For business use there is a variation called ADSL2+ Annex M which trades some download speed to double the maximum upload speed from 1.1 Mbps to 2.3 Mbps. ADSL2+ is generally advertised with download speeds of up to 17 Mbps and our speed test results for the UK indicate that the average median speed is 5.5 Mbps, with 25% testing at speeds below 2.6 Mbps and 25% getting above 10.1%. The median upload speed is 0.6 Mbps. ADSL2+ is the most widely available broadband service over a fixed connection in the UK, with less than a dozen exchanges not supporting either ADSL or ADSL2+. ADSL2+ relies on broadband hardware being installed in the local telephone exchange that your telephone line connects to and this exchange based hardware is connected to a backhaul network to deliver your data to your chosen broadband provider who then provide the ongoing connection to the Internet. The key determining factor in what speed you will get from ADSL2+ is determined the length of your telephone line and the state of repair for that line, the longest recorded ADSL service was on a line over 10km long. When ordering broadband your provider should give you an estimate for your address. At the technical level ADSL2+ uses two bands of frequencies with that occupy the 25 KHz to 2.2 Mhz part of the radio spectrum which is divided into two unequal segments with the upload traffic occupying the lower 100 KHz and the download traffic the remainder. Each of the two bands is then sub divided into small frequency bands called bins and when an ADSL modem is syncing (connecting) it is testing each of these bins to see if it can carry traffic without too many errors. The division into distinct bins makes it easier to handle noise that can occur in a small part of the radio spectrum, i.e. if interference is seen the bin is not used, the downside is of course the more the slower the speed. NOTE: Attenuation is a measure of how much signal has been stopped by the metal telephone line, the figures in the table relate to copper cables and most broadband modems allow you check your attenuation and this will be the most accurate measure of line length since it takes into account all the cable and impact of numerous joints in your line. The retail market for ADSL2+ changed significantly in 2006 via a process called Local Loop Unbundling (LLU) which made it viable for competing retailers to install their own broadband hardware (DSLAM) in telephone exchanges and offer much cheaper telephone and broadband bundles. The roll-out of LLU services reaches some 95% of UK premises compared to the over 99% that is covered by the BT Wholesale network. The LLU competition means that in some locations BT Wholesale based providers may only offer a slower ADSL service, but providers such as Sky, TalkTalk and Vodafone may offer ADSL2+ via their own broadband hardware. BT Wholesale offers a mixture of ADSL and ADSL2+ across the UK, with ADSL2+ still being rolled out. The roll-out is linking to major improvements in the backhaul link from the telephone exchange to the many broadband providers and is designed to improve performance during peak time at night. VDSL stands for Very High Bit Rate Digital Subscriber Line and is a major improvement on ADSL2+. Many variants exist with VDSL starting to be deployed in the UK in 2009 and this was superceded by the newer VDSL2 standard, the difference being that a wider frequency spectrum is used thus boosting the maximum connection speed from 40 Mbps to 80 Mbps (faster connection speeds are possible but Openreach products have a cap of 80 Mbps applied), smaller operators such as VFast and WarwickNet may offer faster speed variants in the areas they service. 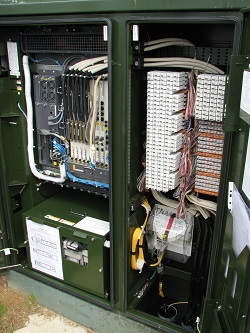 The service works by precisely what its name implies, fibre has been extended from the telephone exchange to the green street cabinet, essentially the broadband hardware (DSLAM) has got smaller and now lives in a small green cabinet near your existing telephone cabinet (the VDSL2 cabinets are identifiable by the ventilation slots in the case). VDSL2 uses frequencies up to 17 MHz which is a lot more than the 2.2 MHz that ADSL2+ occupied and this extra spectrum gives you much greater speeds, but higher frequencies do not travel as far down the metal cables. VDSL2 is often called superfast broadband, which means that the telephone line for an individual property is close enough to the roadside based DSLAM to connect at over 24 Mbps (a stricter definition is 30 Mbps and faster). The table below gives you an idea of how the speeds drop as the length of telephone between the cabinet and the property increases. Be aware that 1500m the performance is much harder to predict reliably, and for some lines with thicker copper or less crosstalk higher speeds may be possible, conversely for those with poor wiring speeds may be lower. August 2017 we updated the premise distribution which has improved largely due to the increasing roll-outs of infill cabinets, which brings a cabinet and fibre closer to more premises. NOTE: The figures are only a guideline with many factors such as the manufacturer of the DSLAM and the chipset in your broadband modem having an impact, as well how Openreach has configured the VDSL2 in your cabinet, e.g. DLM (Dynamic Line Management) profile, G.INP (error correction that allows error correction without sacrificing speed) running, Vectoring available (noise cancellation to mitigate interference from other lines), low SNR margin roll-out or LR-VDSL2 (Long Reach VDSL). Often the biggest impact on VDSL2 speeds after distance is cross-talk and the model assumes a worst case scenario and thus with the current take-up levels particularly at the sub 750m distances we expect a lot of people to do better. VDSL2 uses six frequency bands which extend from the end of ADSL2+ region all the way up to 17 MHz, 3 bands are used for upload traffic and 3 for download, the service is not symmetric since the actual allocation favours download traffic. There is a seventh band that can be used for upload traffic but due to the presence of ADSL2+ in the UK this is not used. As with ADSL2+ each of the bands is sub-divided into bins which are tested during sync time and used to carry bits of data if the signal is not affected by too many errors. In addition to line length the higher radio frequencies used mean that interference from other users in a bundle of cables can slow you down, this is seen by the first person connecting to a VDSL2 cabinet where their connection speed slowly drops over time - this is known as cross talk. 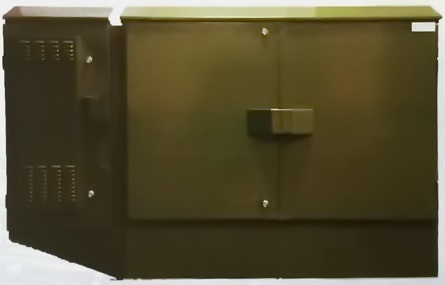 Vectoring is a technology that aims to reduce the impact of crosstalk by using mathematics to effectively perform a noise cancellation for each line in a cable, it is deployed on some cabinets in the UK, but vectoring has never fully matured with respect to VDSL2 but is more successful for G.fast as it was part of the standard from inception. VDSL2 in 99% of cases in the UK is operated by Openreach which as independant division with the BT Group and sells to the wide range of broadband wholesalers and retailers. Three main download speeds are sold up to 38 Mbps (maximum connection speed 40 Mbps) up to 52 Mbps (maximum connection speed 55 Mbps) and up to 76 Mbps (maximum connection speed 80 Mbps), the three download speeds versions utilise identical technology and upgrading to the up to 76 Mbps version will only deliver any download speed benefit if you are already connecting at the maximum speed of your service already. As VDSL2/FTTC arrives over your telephone line you need to use a filter to ensure that any telephones or other devices connected to your telephone line do not interfere with the DSL signal. This is the same as with ADSL2+ but the higher speeds mean getting the filtering right is more important. Microfilters that simply plug into the phone socket and give you a clean socket for your broadband modem and a filtered socket for a telephone are the simplest to use, but if you have lots of telephone extensions in the home then a better option is to fit a faceplate filter at the master socket, two versions are available the Openreach version that just plugs in or after-market versions that fully replace the existing front part of your master socket. VDSL2 speeds can be affected by extension wiring that does not even have a telephone connected, so if you have un-unused extensions disconnecting their wiring at the master socket may improve your speeds. The speeds commonly seen in advertisements for FTTC are currently up to 38 Mbps, up to 52 Mbps and up to 76 Mbps but we expect in the next year for average median speeds will start to be used and our speed test results indicate the median download speeds are 22.9 Mbps, 29.7 Mbps and 47 Mbps. The main cable broadband provider in the UK is Virgin Media, but the Isle of Wight does have an independent cable operator called Wight Fibre. Cable broadband is based around DOCSIS technology and utilises a fibre to the node layout, where fibre carries data to and from a local cabinet, which then has subsiduary cabinets joined to it via co-axial cable. The link from your local subsiduary cabinet to your property is over a coax cable, i.e. single metal core with insulator and braided metal outer under a final layer of insulation (an additional pair of copper wires is used to provide a telephone service). DOCSIS 3.0 is the current data standard used in the UK and fastest download speed sold currently is 350 Mbps with various upload speeds up to 20 Mbps, the newer standard DOCSIS 3.1 which should allow Gigabit (1000 Mbps) speeds to be offered is expected before 2020. Cable broadband is a fixed speed connection since the cabinets are always located at a distance which means the attenuation of the coax cable is not an issue. Virgin Media sells three main speeds at present with 100 Mbps, 200 Mbps and 300 Mbps top speeds and to ensure the 10% advertising rule is met speeds are over provisioned, so if local congestion is not impacting you on the 200 Mbps service speed tests of 210 Mbps are actually possible. Local congestion can be an issue for cable broadband and with people doing more and more with their broadband this does lead to some areas performing worse than others, and this leads us onto the median download speed of 55 Mbps on the 100 Mbps service, 46 Mbps on the 200 Mbps service and 86 Mbps on the 300 Mbps service. Virgin Media is expanding its network footprint with an eventual aim of covering around two thirds of UK premises, this roll-out is a mixture of extending the existing network but where areas are totally new then full fibre is used, i.e. fibre to the premises, this roll-out is often referred to as Project Lightning. For those areas with full fibre is used the same broadband modems and TV set-top is used as a convertor is used to take the light signals and convert this into the usual coax format, this way of using FTTP is called RFOG. The full fibre areas currently do not support a telephone service, but it is expected that Virgin Media will offer a Voice of Internet Protocol (VoIP) service in the near future. Increasingly FTTP is referred to as full fibre with the name partial fibre referring to FTTC. Fibre to the Premises as its name implies extends the fibre (which is a thin strand of glass which is flexible) into your home or business and this terminates in an ONT (Optical Network Terminal) and most services then connect a broadband router via an Ethernet cable. 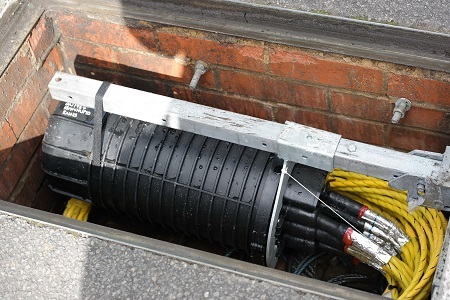 Hyperoptic is the largest operator of a variant of FTTP called Fibre to the Building and they install fibre into the basement of an apartment block, and take a fibre to each floor with the final connection from that fibre being over a short run of Gigabit Ethernet. The distance of Ethernet cable used means there is no speed drop between where the fibre ends and the router that providers your Ethernet LAN and Wi-Fi service. The UK as of April 2017 only has full fibre available to some 2.5% of UK premises (~720,000 premises) but this is starting to grow at an increasing pace, with roll-outs by several providers underway. Speeds vary greatly from entry level services of 20 Mbps all the way to Gigabit (1000 Mbps) but once the fibre has been installed upgrades to go beyond Gigabit are very cheap, the time and effort is involved in getting the fibre into each property in the first place. Openreach is currently the largest provider of full fibre services in the UK, with products known as GEA-FTTP that offer speeds from up to 38 Mbps all the way up to 300 Mbps (upload speeds vary between 2 Mbps and 30 Mbps). Business GEA-FTTP now also has a Gigabit option. Openreach use a system called GPON that reduces the number of individual fibres needed by using different frequencies of light for each connection and optical prisms to combine and split the different wave lengths of light as the fibre is sub divided as you get closer to each property. GPON has a maximum speed of 2.4 Gbps currently, but a new standard XGPON increases this to 10 Gbps. The alternative way of deploying fibre is to dedicate 1 fibre per premise connected until you reach a backhaul node, which can increase deployment costs (but only by about 10%) but this gives a lot more flexibility and makes symmetric Gigabit speeds feasible plus options for much higher speeds well beyond 10 Gbps now. The Openreach FTTP roll-out is sometimes the only superfast option and is increasingly being used in the BDUK roll-outs, there is no price premium on FTTP if you are ordering the up to 38 Mbps or up to 76 Mbps version, but the wholesale install cost is £99+VAT compared to £49+VAT for FTTC because you need to pay for an engineer to visit to install the final few metres of fibre. Some people see Fibre on Demand (FoD) mentioned on providers checkers and get excited that they have FTTP available, but the On Demand element for the FoD service indicates that there is still a lot of work that needs doing and when you make a request for the service a customised quote is created for you. The minimum install fee is around £1100+VAT and monthly prices of around £300 per month apply for the three year minimum contract and currently only one speed is available 300 Mbps download and 30 Mbps upload. This service is aimed at businesses who do not need the full guarantees that come with leased line services, and thus bridges a gap between consumer grade services and full business grade products. While FTTP does not have any of the usual distance limits that DSL services have due to signal attenuation which means your connection speed will always be the speed that you paid for, it does not eliminate variable speeds totally since no matter what type of FTTP (GPON or point to point) you will still be sharing bandwidth with other users at some point. G.fast has been talked about for a couple of years and there may be some confusion over how it will be deployed in the UK. The traditional view of G.fast was that it would be a small weatherproof box located at the last telephone pole or pavement chamber before a group of a dozen or so properties, with fibre connecting this box back to the core network and then offer people download speeds of in excess of 300 Mbps (and upload speeds in the 100 Mbps region) over perhaps 50m of cable. This was certainly the case with the first version of G.fast, but working with manufacturers BT and Openreach managed to get the standards changing so that more power could be used and a different type of roll-out from Openreach is underway. 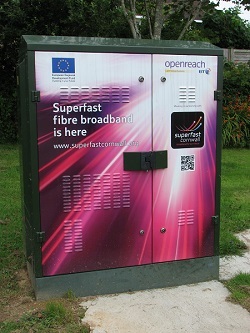 The Openreach G.fast roll-out is in its early stages and with trials now out of the way people will start to see more green pods with vents appearing on the left or right hand side of their telephone cabinets. This side extension houses a G.fast DSLAM and takes a fibre from the nearby VDSL2 cabinet and a power feed - the pod is attached to the copper street cabinet to avoid extra distance being added to the copper, since increased distance means lower speeds. G.fast is still so new that we don't have a large set of speed test data to verify this table yet, but we will update once retail services are more common (updated August 2017). G.fast is somewhat like an extension of VDSL2 with data allocated to small bins across the radio spectrum up to 116 MHz and it can co-exist with VDSL2 with appropriate power controls to avoid the two interfering. Vectoring is an absolute requirement, and this means at present just 48 lines are supported in each pod, so if G.fast arrives and you are keen its best to get your order in early, the pods have space for 96 lines and once the processing units have been tested the extra hardware will be added. Vectoring is a very intensive computing job, and is currently pushing the envelope of what is possible in a small unit. Openreach has an ambition to deploy 10 million lines of G.fast before 2020 and by using the pod system where power and fibre is already available the roll-out has the potential to be very quick. Openreach also plan a simultaneous expansion of their GEA-FTTP footprint from around the current (April 2017) 330,000 premises to two million premises. Initially two product speeds are expected with download speeds of 300 Mbps and 160 Mbps and upload speeds of 50 Mbps and 30 Mbps, and speed tests we have seen from the limited trials suggest that if under 100 metres from the pod you can expect the full 500 Mbps, speeds are expected to drop off such that at 370 metres the speed will be around 100 Mbps, i.e. better than VDSL2 at that distance. Unfortunately no benefit compared to VDSL2 is currently expected beyond this point, and Openreach are not planning to sell the service to anyone where the speed estimates are below 100 Mbps. The future post 2020 may see smaller G.fast pods being stuck into pavement chambers or on poles, but a lot depends on how popular the faster speeds are. These smaller nodes already exist in some areas providing VDSL2 services, but widespread use is difficult due to the costs of sourcing a reliable power supply. Wireless has existined for many years, but what distinguishes fixed wireless from mobile and Wi-Fi is that the aerial is fixed to the property. Potentially the aerial could be a small one located indoors but brick walls are not a friend of wireless signals thus much better reception is gained with an external antenna and ideally located as high as possible, in fact very similar rules to attaching a TV aerial to a property. The antenna on a property is usually oriented so that it has line of sight to the local mast (or near line of sight - which means limited obstructions are not an issue). The masts can be dedicated to the fixed wireless service, or co-exist with other services such as mobile on a mast. 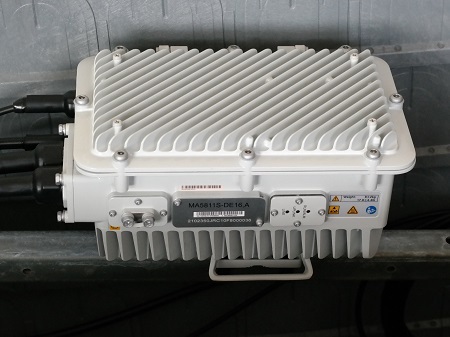 While some masts may have a single antenna providing a near 360 degree bubble of coverage, most deployments have multiple antenna splitting an area into sectors, thus improving coverage and also reducing the number of people you share your section of the radio spectrum with. In the early days some fixed wireless services relied on the unlicensed Wi-Fi spectrum but as Wi-Fi devices exploded in shere volume operators have moved to different parts of the spectrum where they have better control. Developments since the first fixed wireless services appeared mean it has seen increasing speeds and services are starting to be deployed that can provide ultrafast speeds. The exact speeds you will receive depend on many factors, but distance to the mast and the amount of obstructions are the main limit, for this reason fixed wireless providers will not normally guarantee service until a site visit has taken place. Speeds delivered by small mobile devices has improved immensely in the last few years, and much of this is down to advancements in signal processing, i.e. very faster and smaller processors mean more data is being squeezed out of the radio spectrum. Mobile operators have their own radio allocation, with Ofcom running auctions for spectrum when it becomes available, an unfortunate side effect of this is that some mobile operators have more spectrum than offers or have a section of spectrum that is suited to long distances i.e. need less mobile masts. The spectrum for 3G was auctioned off in 2000 and for a few years felt very fast, but in 2017 if your mobile falls from 4G back to 3G things feel very slow, a lot of this is that latency on 3G was never great, 100ms or worse and many websites and apps on smartphones are making lots of small data requests which makes high latency much more noticeable, plus individual web pages are much larger in terms of Mega Bytes. 4G in the UK saw its spectrum auction take place in 2013 and 4G brought much higher speeds than 3G, you could say 4G is the superfast mobile broadband compared to old fashioned ADSL like 3G. 4G as well as boosting download and upload speeds also reduced latency, and with improvements to the 4G standard mobile broadband speeds are increasing annually, to the point now where the best speeds can be in the 100 to 200 Mbps region. Unfortunately 3G and 4G are reliant on a mast, and while rule changes allow higher masts and make planning permission easier have improved coverage there is still lots more to do. One problem that can strike 4G services (and was seen on the old 3G services too) is that if you get too many people in a small area that the mobile mast will not cope with the number of devices, or if the mast does cope the actual bandwidth used will mean everyone slows down to the point of it not working. Solutions such as small cells are being increasingly deployed in places like train stations to cope with rush hour etc. 5G is the next evolution of mobile broadband and while a lot is promised, many will remember similar promises from 3G and 4G. 5G does appear to offer exceptional latency performance potentially down to 1 ms and while labs having demonstrations of speed tests far in excess of Gbps this will only be achieved when very close to a mast and for the ultra high frequencies used in the demonstrations (60 GHz) a single sheet of paper is enough to block the signal. Therefore while 5G will be a big change compared to 4G, the big promises of replacing fixed line broadband will only come to fruition if 100,000's of new mobile masts are installed - the clever part is that 5G masts are likely to be so small they will fit into street furniture such as traffic signs and lamp posts. Other improvements include using multiple frequencies at the same time in a mobile handset, so even seeing just a second or two of Gigabit speeds means a video can buffer masses of data and doing this seamlessly unlike the slow hops you see now as a mobile phone flips between 4G and 3G. Two way satellite broadband where you use a satellite dish to transmit and receive data to a geo stationary satellite that is positioned above the equator some 32,000km from the earth means you can get broadband almost anywhere that you can see the southern sky. The size of the satellite dish is smaller in 2017 than a decade ago and is usually similar in size to a Sky TV satellite dish, and can be wall mounted or if needed mounted on a pole on the ground e.g. to the side of a property to ensure line of sight to the satellite. As alignement with the the geostationary satellite is even more critical than with satellite TV due to the two way nature of the signal a professional install is needed, but the cost of this can often be covered by a broadband voucher or spread over the term of the broadband contract. Once your data reaches the geo stationary satellite it is sent to a larger ground station, and from there starts its journey down fibre to where ever you are visiting on the Internet. The return journey means that the signal takes some time to reach the satellite and then return to earth, so satellite broadband is not good for latency sensitive tasks such as many online games due to the 800ms of latency (ADSL2+ is around 30ms, VDSL2+ 10 to 20ms and FTTP can be down to 1ms) but for those where no other options are available it does mean web access, video streaming and file downloads are possible. Costs are also coming down over time so video streaming, etc. is becoming more possible on these services. Download speeds vary from 2 Mbps all the way to 30 Mbps, with a best upload speed of 6 Mbps generally. Satellite broadband packages generally have a usage limit to try and manage peak time capacity, but many will offer unlimited downloads over night, so a common thing to do is schedule large downloads to the midnight to 6am period. There are future development plans afoot to deploy a cloud of satellites in a much lower orbit, and while none of them will be stationary relative to your position on the earth if enough satellites are in this low earth orbit you will always have visibility of one and modern electronics makes handling switching between satellites a lot simpler than a decade ago. The closer orbit could well bring latency back into line with ADSL2+ services and much improved download and upload speeds, but for now this is just theory.